The kids are home for the summer and we are looking for fun things to do during the week to make memories and frankly, to keep the kids occupied! A day trip is a perfect way to get out of the house without having to worry about campsites or hotels. This is the first in a series of day trips I will be writing about this summer. Estes is a great place to start! Estes Park is only an hour drive from Boulder, it’s a beautiful drive, and you are guaranteed a good 10 degree drop in temperature as you climb 2,000 feet in elevation. There are so many fun things to do in Estes Park, as well as nearby Rocky Mountain National Park — consider some of these fun activities to add to your itinerary. A Colorado favorite, Rocky Mountain National Park is a great escape into nature. The park encompasses 415 square miles of natural settings including some of Colorado’s highest mountains, lush evergreen forests and fascinating wildlife. Stop by the Alpine Visitor Center to pick up information on the park. RMNP offers many hiking trails for people of all ages and abilities. A favorite, accessible trail for people of all ages is Bear Lake – the trail loops around beautiful Bear Lake, with gorgeous views of Hallet Peak. More adventurous hikers will enjoy trails like Alberta Falls and Nymph Lake. Here are some photos from our hike to Alberta Falls. Entrance Fee to Rocky Mountain National Park is $25/car per day, $35/car for a 7-day pass. Annual Passes are $80 (FREE for U.S. Military) and grant access to more than 2,000 National Recreation Sites for the full year. For a great, easy place to take the kids for lunch in Estes Park, stop by Bob and Tony’s Pizza in downtown. My oldest doesn’t like pizza (what?!) but Bob and Tony’s has more than pizza on the kids menu: they offer PB&J sandwiches, hot dogs and more. My little one can’t decide if the statue out front freaks her out, or if she kinda likes him. Bob and Tony’s Pizza is located at 124 W Elkhorn Ave, Estes Park, CO 80517. 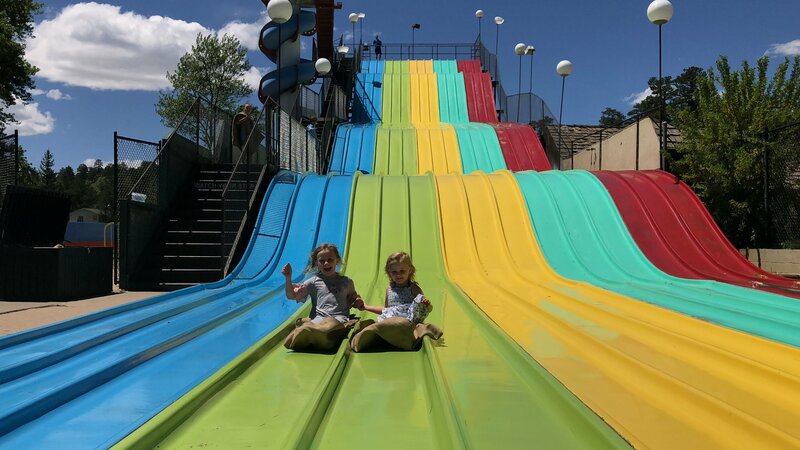 Estes Park is full of fun things to do with the kids, but when I mention Estes, my kids always request a stop at Fun City. This amusement park has been charming kids since 1969. Adults will get a kick out of the retro feel of the park while kids delight in the thrill of go-karts, bumper cars, mini golf, bumper boats, bungee trampoline and more. The kids’ favorite is the rainbow slide! Fun City is located at 455 Prospect Village Dr, Box 483, Estes Park, CO 80517. Open Saturday – Tuesday 10AM – 8PM, Wednesday – Friday 10AM -5PM. Admission: $2/Ride on the Rainbow Slide, $7/Driver for Bumper Boats, $10/Driver Go-Karts, $6/Driver Bumper Cars. For all the activities and pricing, click here. There are a bunch of ice cream shops throughout Estes Park’s downtown, and I’ve never been disappointed. Each shop has its own unique ice cream flavors and other delicious treats like candied apples, salt water taffy and other candies. My kids got a kick out of watching the “candy man” making a huge slab of toffee as we sat enjoying our ice cream at Laura’s Fine Candies. Laura’s Fine Candies is located at 129 E Elkhorn Ave, Estes Park, CO 80517. After all this excitement, I was in need of some serious caffeine before the drive home. My favorite stop for coffee in Estes is a little coffee shop in The Old Church Shops called Raven’s Roast. I love the mocha, but you can expect a full espresso menu to choose from. Raven’s Roast is located at 157 W Elkhorn Ave, Estes Park, CO 80517.